Every devotee of Lord Sai Baba gets unique experiences that they are very much insisted to pen down them and share with world at large through this blog. I would certainly thank devotees, but far more than that i thank our Lord Who is always active for His devotees. See today's experience and a message which the devotee wants to convey to us. Sai Sister Shifana Ji from India says: Dear Hetal Ji, I am Shifana from Chennai. I came across your blog, when I was surfing for Sai devotee’s experiences. From the day, one believes me or not, I am really stuck with your wonderful work. 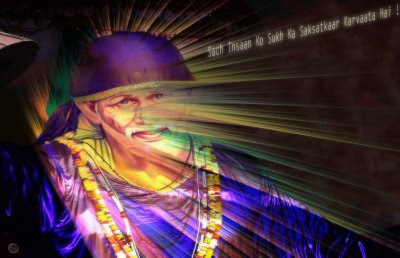 From the deepest of my heart, you are doing a great-great-great job in bringing Sai devotees together in giving them space to share and write their real experiences in the right place (Web), where millions could reach out and gain knowledge from it, reading them brings us even closer to our Baba. I would like to share my experiences with you all. I kindly request you to post my experiences on your blog. This is my first post that I am sharing. I never knew about Baba, nor have seen Him even on picture. But once my cousin mentioned about Saibaba, but it never entered into me. In 2008, my aunt took me out and I was never told where we were heading to. Finally we reached the place. It was Sai’s temple and that was the first time I saw Him. I was telling Baba that “I really don’t know who You are God. It’s the first time I am seeing You and I don’t know anything about You”. I was into a relationship for 3 years by that time. So, I even prayed Baba for wellness of my relationship and to get married to him, also to make our parents accept our marriage. He is a Muslim and I was Hindu. After a little while, we left the temple and the days just rolled on. In the year 2009, I had to do my college project for which I joined in a company. There I was given training by a lady employee and to my wonder she was a thick Sai devotee. She used to have small Baba’s idol in her desk. Every small activity that she did was with Sai’s grace. Watching her dedication towards Baba grabbed my attention to ask her about Baba. Then later she explained the experiences and miracles that happened with her. I was moved by it and tears of happiness started rolling down. I was very much attached to Baba by then. So, I requested her to get me a photo of Sai. To my surprise she gave me small idol of Baba, which she brought for her manager from Shirdi. Baba had a plan to give it to me. Why because, he left the idol without even unpacking it in his desk, when he got transferred to some other place. So sweet of my Baba that He picked me in His hands. It is true that without Baba’s wish, no one can get close to Him. He knows the best for us and the right time to stand for us, when we need Him the most I am very much thankful to Baba. It was the first time Baba came to my house (idol). My parents too agreed it and that was the first time they came to know about Baba. Days rolled on and I started knowing more and more about Sai Baba by surfing the net. He just slowly changed my life and I started living by His teachings. Baba knows our past and future, so He had been guiding me in all the ways and I believe He made me to be His devotee to really help me out from all my future crisis. Through Baba’s blessings, I was able to be friend with one of my college mate. Even she was Baba’s devotee. Slowly we became very close and started visiting Sai’s temple together often. One day, I saw 9 Guruwar Vrat book with her. She said anyone can do it and it’s very powerful. Thus I got one English version of it and started doing the vrat. That was for my marriage. I completed the vrat with full devotion and faith and handed over my life’s decision to Baba. After few days, I and my lover had some serious misunderstandings between us, which made our interaction and connection weak. I was very much upset and wondered why Baba has given me such terrible days. Sometimes even I fought with Baba. But then too I never gave up my faith and love for Baba. During that period, my parents informed me that they are going to start looking for alliances. I was very much worried. I gave up everything to Baba. A year passed on, they were very much serious about my marriage. I prayed so much to Baba and by Baba’s blessings one day I and my lover started talking normally and all the misunderstandings between us washed away. It was like I got my life back. I was very much happy and thanked Baba a lot. Baba knew we both love each other a lot and we cannot be without each other. So we decided to marry soon and were ready to face all the problems that came our way in the name of Religion. Even in that tough time, we both were fighting for our love, stood strongly for each other, nor Baba left us alone. He was helping us all the time. Today we are married couple and our parents are slowly turning back to normal. But with Baba’s grace, even this problem will be over soon and both the families will be completely normal. I am always thankful to Sainath. Baba has made me realize a strong truth that “He never leaves our hand once if He grabbed, He holds it for lifetime and helps us in every moment of life”. He is so sweet and I always adore Baba a lot. Baba never left me, when I was in pain, nor He will leave me in future. Baba Ji Thanks for all Your support. None of us are perfect but, if we look around most of us are leading the wrong way of life (materialistic), where there is no Humanity around. But hatred, ego and jealous are on the brim that we are ready to kill each other. The actual purpose of Religions and God are completely misunderstood all around the world and we have started waging wars and killing each other in the name of Gods. More importance to worldly things – money and materials has corrupted us to such an extent that many are ready to betray their parents and let them to streets. In this world, we lack humanity. Many don’t realize that this is not the way to live the gifted life of GOD. Love and compassion are necessities not luxuries without the former humanity cannot survive. By Baba’s grace, I am His devotee for couple of years. By Sai’s blessings, Spiritual feeling has blossomed into me. Until Baba wishes, nobody can become close to Him. I personally sense that Baba has drawn me to Him, so that He could mold me with His ways and make me lead this worldly life in righteous path. With His grace, the importance of a Guru is understood. Today with Baba’s blessings, I am trying to change myself and in every phase of my life I am living by His teachings that He has taught us all. Baba has ten-folded my limited knowledge about pursuing life. I am really grateful to Baba that He came into my life and molded me with His perception of life. From my experience, I can promise that anyone, who leads life the way He has taught us, will acquire peace and boundless happiness. My Guru made me realize the importance of humanity. Even if a minute is spent in praying or chanting any God’s name with Purity and compassionate thoughts, that’s more blissful than going to temple and performing Pooja or praying for hours with contaminated thoughts inside. By Baba’s grace I got motivated. My urge of helping people increased and was waiting for the right opportunity like this. On March 1st 2012 Thursday, in the morning hours, I was listening to “Sai Tere Hazaaron Naam by Rana Gillji”. Suddenly a feeling raised “Why don’t I start SAI NAV GURUWAR VRAT by requesting other Sai Devotees to become One and do a VRAT together for humanity among people. Pray Baba to bless all the children around the world to wash away their sufferings, disbelieves and help those who are leading a terrible life. Making them realize the spiritual path in this materialistic world and the divine concept of Sabka Malik Ek”. In this Kalyug period, we people are not able to get the righteous path in which we can get rid of doing the bad deeds. We are corrupted from our soul level. A Miracle should happen all over so that people slowly realize and walk towards spiritual path and understand the importance of humanity and become pure. We know that this birth and death in this earth is a cycle till we repay our own deeds. We should be conscious of - “what is Right and what is Wrong?” so that we can get salvation from this worldly affairs. Sudden thought of Hetal Ji’s Blog aroused in my mind and through her help. I wanted to post my request to all the Sai Devotees to join as ONE to perform the Vrat. Through this, I am not trying to convey that one should leave his/her own Religious path and worship only Sai Baba. All the Religions in this world state that God Is One, God Is Light. He has got no form and no Religion – He is the Religion of Love, Harmony and Humanity. He is the Supreme Soul. Sai always had pointed out the importance of unity among Religions. He united people from Hindu, Islam, Christian, etc., and curbed their Hatred among themselves. He emphasized His children to lead a simple life, be Lovable, help others, be compassionate, have state of inner peace, have pure devotion to his/her God/Guru and give up all bad desires (foul speeches, ego, jealous, anger, pride, lust). I attain eternal happiness in helping people and I am grateful to Baba that He made me to come out and request you all. My Guru is everything for me and He had made me to write this. I am surrendering myself to You completely, Baba, guide me forever and show me the moral path in this birth and in births later on. Take off all my bad thoughts, keep teaching me Baba. Bless all of us forever Baba. I am really not that good in expressing my views and to put my thoughts in words. I thank my husband, who helped me in editing this post. I even took some help from Baba’s site to bring out the right words. Baba knows my inner heart. So, I trust it won’t let me down in gathering His devotees as One for this cause (VRAT). So I request Hetal Ji and other devotees to support me for this social cause and let’s get together and take a step to make this world a better place. Despite if the change doesn’t happen to the widest, let it happen with the fewest as an initial step of great cause. My sincere apologies to everyone and to Baba, if I have hurt somebody’s feeling in this post unknowingly. Shifana ji you are such a wonderful person that is why you have got such a beautiful thought. Wow such a great thought you are really blessed by our saibaba. You are really lucky. I love u so much sai baba. What a beautiful post! All the strength to you. We all bow before Sai Nath. Beautiful experience Shifana. Sai has come into my life in the past year. Earlier I never believed in him. It is true Sai brings his devotees to him like a sparrow with a thread tied around its feet. In this past year my life has been in such a turmoil, but Sai has never left my side. I had a miscarriage and blamed Sai for it. He ultimately showed me answers to my troubles through the Sai Satcharita. I came to know about the Satcharita through this website and thank Hetalji and others for their continued efforts for this website. I cannot thank you enough. Sai is the ultimate wire puller, He is the one who has held my hand and shown me the way , when everyone else had left me. He is my father,mother. He has shown me that being a good human being is the essence of spirituality. Earlier I was caught up in negativity, jealousy,ego, critising others. Baba has shown me the sins I was committing, and helped me to remove these bad thoughts and try and be a better human being. Sainath I surrender my life at your feet, please remove all bad thoughts and evil from within me, hold my hand and guide me through this life. Shifana,Its normal human tendency to always ask for our own selves whenever we pray to god. You are doing a good deed, spreading Sai's love throughout Humanity. I would love to be a part of your cause. Although I am presently doing the navguruvar vrat for my husband, I would also include in my prayers to Sai to remove the sufferings of his children and make good human beings out of them. I am sorry for this long post. I was just so overwhelmed reading your experience. I could not hold back. All our love to our beloved Sainath. Splendid thoughts Shifana. I felt so much happy today on reading your blog that there are people who still thinks exactly like me. Sometimes I feel that there is no good among other people. Even if I am good, it is not helpful and I am going to depressed state. But after reading your blog I felt so much happy that my feelings towards God and other people is true and correct path. I have been thinking to do nav vrat for my kids. But now I am thinking that I should do nav vrat of Baba atleast once in a year for the welfare of all children in the world. Thanks for spreading such a good cause....and Thanks to Hetal for sharing this....All the best to you and your family. The compatibility of spirituality and religion is very relevant in Sai Baba`s spiritual philosophy. Sai Baba says,"Sabka Malik Ek". Excellent thoughts shifanaji. Very nicely drafted.Thanks for sharing it. Best wishes for you and your family. u r a blessed soul.may SAI BABA bless u in all ur endeavours dear. Sai Ram Shifanaji. May Baba bless all. You are a self less soul. Baba will surely bless. I would like to be a part of you Vrat puja, Please let me know. MAY SAI BLES ALL. nice thoughts shifani ji. while you might think the world is in a horrible state, let me tell you that there is a lot of good in the world too. just see the work narayanan krishnan is doing in madurai, it really moves your heart. it's just that media and movies focus too much on the bad and not on the good. i also like your thought on guruvar vrat. why can't you plan so that the 9th guruvar will end around the same week as guru poornima day. I agree on your thoughts and i also feel the same. There should be a step taken to make human realize what is fact and why are we born. But with the busy family life and other circumstances i just neglect my thoughts. Sometimes I feel like being myself leaving everything and just be with God, but this can't happen as i am a Mother. However if you can let me know the date and time i will surely join the prayer. Very nice post expressing your true feelings about humanity.It's a novel idea to start Nav Guru Vrat for humanity.May Babaji bless us all to lead a peaceful life!!! Dear Shifana ji, I am very happily surprised to read your posting that made me feel as if I have written this! Thanks so much for expressing this in such wonderful words.With our efforts by BABA's grace we surely can bring awareness in people to TRUST GOD and be on the right path. The CHANGE in thinking of people would come gradually but surely and that is what BABA wanted from all of us. Understanding the significance of "I AM" makes our life more peaceful and useful to others. Thanks to Hetalji for posting the Experience . my At most thanks to Other Sai Devotees who responded and wanted to start a Vrat. Frankly speaking i was in dilemma whether others will respond to what i shared or it would go unrecognized , but i had Faith on Sai, if he wanted to perform Vrat he would support me. Thus it happened. Again i Request Sai's devotees to support and respond in large number. Please post on the forum when we can start the Nav Guruwar Vrat. so that we all can start together. Thanks for all your comments . We all are blessed souls, we just need to realize it. @Anonymous I totally agree with what you mentioned, I never intended or meant to say that there are no good deeds happening in this world. but when compared to the sufferings of the people it is not reaching each and every one. WONDERFUL EXPERIENCE AND WONDERFUL MESSAGE. BABA PLEASE BLESS ALL PEOPLE IN THIS WORLD TO LEAD IN YOUR PATH AND LEAD HAPPY PEACEFUL AND HEALTHY LIFE. Hi Safina, loved ur experience.Actually I was thinking of doing Sai Nav Guruvaar vrath from past one year but never thought about it seriously. From past few days I was thinking more about this Vrat as i dreamt about it . And after few days I also received a mail in the morning telling how to do this vrat. After reading that i felt like may be Baba is asking me to do this vrat. In the evening I read ur experience in which u asked everyone on the blog to do the vrat. I felt like I got answer for my question. Today is Thursday and I have started the vrat. Thankyou verymuch for sharing ur wonderful experience and also answering my question. I'll pray Baba to bless us all and make us understand the importance of Unity . very nice experience and well drafted as well. Shifana Ji, Hats off to your feelings and thaughts for humanity. I also want to join you for Prayers & Sai Vrat. Kindly let me know the exact Date to start. BABA WILL I EVER BE HAPPY???? YOU KNOW I HAVE SUFFERED FROM MILD DEPRESSION FOR 17 YEARS !1995 TO 2011 STILL IN 2012 I AM FACING SO MANY PROBLEMS REGARDING MY RELATIONSHIP??? ?WHEN WILL I BE HAPPY ??? IF YOU CANT GIVE ME HAPPINESS THEN GIVE ME AN EASY DEATH .....CONVINCE GOD TO GIVE ME DEATH PLEASE CONVINCE HIM TO GIVE ME DEATH....DONT YOU THINK I HAVE HAD ENOUGH!! !HAVE MERCY ON ME BABA!! !WHAT BAD KARMAS I DID IN MY PAST LIFE???? IN THIS LIFE WHATEVER BAD DEEDS I DID IT WAS JUST RRACTION OF MY DEPRESSION OR FRUSTRATION! I NEVER HURT ANYONE...NEVER OFFENDED ANYONE WAS VERY HONEST.....SO FOR WHAT YOU ARE PUNISHING ME?????? ?PLEASE HELP ME BABA!! And i request all the Anonymous devotees who r interested to join the vrat to respond through the forum so that we can finalise. Very nice experiences! Shifana Ji, it is very wonderful and noble that you are doing whatever you can to help others. Do let us know the date when to start the vrat so we can help our brothers and sisters in this world. It is wonderful that you and your now husband were able to be brought together by Baba. I know Baba also brought my wife and I together, so that also makes me care for her all the more (since she was selected for me by Baba). The quote you gave, “He never leaves our hand once if He grabbed, He holds it for lifetime and helps us in every moment of life," brought tears to my eyes since it is so true that Baba once gets hold of us we will be in his grace forever. Om Sai Ram! Your thoughts and prayers are wonderful. But I have to mention this to you. Yes, the world has more inhumane people, wrong doers and criminals now. But, at the same time, this beautiful world also has more ardent devotees, more people who believe in gods and sadgurus, more temples, more satsangs than ever. In earlier days there were lesser platforms for people to get together and talk of Gods glorys, but now there are many of us who talk through various media about Baba and gods. So, though it might seem like the world is going bad, acutally it is getting better on one side. God made this world. He is also the protector. Blaming that the world is going bad simply means that we feel that god is not doing His job well. He will never let this world go bad. Nature always works towards perfection. God does not see difference between good and bad people, He simply puts us in the correction path when we go wrong. When a person does something wrong, it only means that god lets him do that mistake so that God can teach that person something important from his mistakes. The supreme power always knows what to do. Of course we all can and should pray for well being of the world, but there is actually no need for us to worry our head off for the way the world is going. It is Gods world, He knows what to do and how and when to do it. Even in His 11 promises Baba says, 'If you ask for my advice and help it will be immediately given'. There is a big message in this line. He gives us opportunities to do something and then learn from the mistakes. He makes us invite trouble so that we can go to Him for help. He is the Best teacher ever on earth and He leads and guides us to betterment. Once He teaches us something, we will never, ever go back to our mistakes not only in this birth, but in births to come. Sorry if I have contradicted many views and have been too outspoken, but I always hear people saying the world is getting worser. When we clean up a place or room, at first all the filth and dirt should come out before we decorate it. Thats what god is doing - cleaning up and getting the filth out of our minds before He is decorating it. He knows what He is doing. Sorry that my reply was too long. Dear Sai Devotees, kindly listen to discourses of Shri Shivakrupanandji of Samarpan Meditation, the enlightened living Sadguru, who is spreading the message of Shri Shirdi Sainath. The message of humanity. Search for "discourses by Shivkrupanandji"
DEAR DEVOTEES, WITH BABA'S WISHES WE HAVE STARTED WORSHIPPING BABA'S PUJAN IN A MAKESHIFT ROOM AT VILLAIGE PALLIKANTA, IN ERSAMA TEHSIL/TALUK/COMMUNITY DEVELOPMENT BLOCK OF IN COASTAL JAGATSINGHPUR DISTRICT IN ORISSA. IT'S 40 KM SHORT OF PARADEEP PORT. THIS REGION WAS IN INTERNATIONAL NEWS WHEN THE SUPERCYCLONE OF 1999 HIT THE AREA WITH HIGH TIDAL SURGE LEAVING MORE THAN 10,000 HUMAN AND 1 MILLION ANIMAL DEAD. WE STARTED WORSHIPPING BABA ON THE HOLY GURUPURNIMA DAY THE 3RD OF JULY, 2012, TUESDAY. WE NEED SOME SUPPORT TO MAINTAIN OUR DAILY PUJAN EXPENSES AND PRSASAD SEVAN ETC. wonderful post and wonderful thought shifanaji...hats off to you because in day today's life everybody are intrested in there life only..nobody thinks about others and there problems.but you are talking about to pray for others is very good thought..may baba bless everyone with peace love and good relationships.let me know if i can help you in your venture..om sairam..